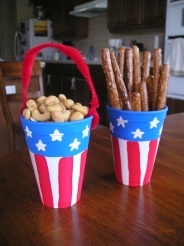 This Patriotic Treat Cup is a great, inexpensive kids craft to help celebrate Fourth of July or Flag Day. Decorate your American themed table with these treat cups, or give them away as loot bags! 1. If you want a handle on your treat cup, punch out two holes on either side of your styrofoam cup with a pencil. 2. Paint red stripes up 2/3 of your cup (you don't need to paint white stripes since if your cup is already white). Next, paint blue around the top 1/3 of the cup and now you're ready to paint on your white stars. If you have star stickers you could always stick on the stars - which may be easier for little ones. 3. Insert and secure the pipe cleaner in each hole to make your handle. Fill up your cups with different treats and you've created a great decoration or party favor!